LankaBangla Foundation undertook a tree plantation program on 09 August 2017 at Ramu Cantonment, Cox’s Bazar. A total of 6,000 mango saplings are planted at lake side road in this new Cantonment. The plantation was supported by the 2 Infantry Brigade. GOC and Area Commander, 10 Infantry Division, Maj. Gen. Mohammad Maksudur Rahman, psc; Commander 2 Infantry Brigade, Brig. 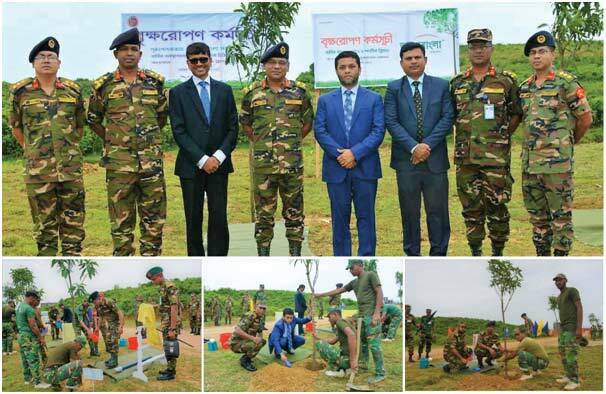 Gen. Abu Syed Mohammod Bakir of Ramu Cantonment; Mr. Mohammed Nasir Uddin Chowdhury, Managing Director, LankaBangla Securities Limited and Mr. Khwaja Shahriar, Managing Director, LankaBnagla Finance Limited jointly opened tree plantation program in a small ceremony. The plantation began by planting lengra mango sapling by each of the above personalities. LankaBangla undertakes tree plantation program every year as part of its CSR responsibility on environmental protection. This year the plantation took place at Ramu Cantonment with focus on sustainable long term environmental protection for better living for local community. Commander 2 Infantry Brigade and his team managed and executed the overall plantation in a smooth manner. LankaBangla emphasized on green revolution through tree plantation in remote areas to create a healthy environment for locality.